Our new Ultra Rugged Tablet PC is powered by a Haswell 1.6 GHz Intel Core i5-4200U processor that was designed for high performance computing and uses the Intel HD 4400 Graphics chipset. The R10IH8M-RTT2GP comes with a 10.4" high quality XGA (1024 x 768)screen, this 4-wire resistive touch screen may be operated with ease by either a plastic stylus or fingertip. This newsletter covers the features and specs of our new device. 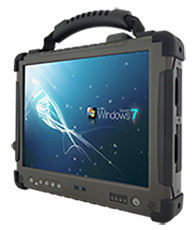 Winmate's ultra rugged tablet pc has an exceedingly simple and brilliantdesign. It's fanless body utilizes an aluminum–magnesium housing which is great for both cooling and protection. It consists of two halves which come together to make a very sturdy device. Winmate designed the first Intel Core i5-4200U Haswell powered Ultra Rugged Tablet PC with a minimum number of hardware controls and buttons in order to make it as simple as possible to operate. It can come equipped with an optional 2.0MP Front Camera for video conferencing and 5.0MP rear camera for additional data capture. On the bottom of the R10IH8M-RTT2GP display you see a large power button, as well as up and down buttons used to select and adjust multiple settings. There are also three programmable function buttons labeled F1, F2, and F3. Each responds to either a short or a long push so that you can assign a total of six functions. All interface blocks have protective rubber plugs that are attached to the unit via rubber hinges, these plugs must be pushed firmly into place in order to provide an effective friction seal. Protected against water, extreme temperatures, shock and dust, the R10IH8M-RTT2GP offers the more durable solution. The operating temperature rangewhile running on a battery is -10°C to 50°C which is good enough for most business and field environments, but can withstand temperatures of -20°C to 60°C while running on AC power; it can also survive a four foot vertical drop to concrete. Operation Temperature -20 deg C. to 60 deg C.